Penelope Van Osten has a Macy’s American Express credit. She said she only used the card for purchases at Macy’s, and she hadn’t used the card in a while. So when she received a billing statement in late September 2015 that said the account was overdue, she assumed there must be a mistake. She said she contacted the billing department. “After explaining that I didn’t make the charge or even know of a company called OneTravel, she put my account into billing dispute and said she would have someone look into the charges,” Van Osten said. She was given two referral numbers, and the rep said it would take several weeks for the investigation to be complete and Van Osten would be notified of the result. Time passed and she waited. By early December, she was tired of waiting, so she found an email address for OneTravel. She sent an email explaining what had happened. She asked for details about the charges, saying they were not hers. OneTravel responded, saying it would look into it. On Dec. 10, she received another email from OneTravel. It asked Van Osten to send the “8 digit numeric booking confirmation number,” plus the billing phone number and the email address used for the booking. The email also included an 800-number and a chat feature for OneTravel, so Van Osten tried the chat. So she emailed the billing department, and she received a reply with a phone number she should call. She tried to call multiple times, she said, but she kept getting an automated message that the number was unavailable. Van Osten sent another email to OneTravel, asking for a correct phone number. Then Van Osten received another bill indicating an overdue charge, so she called for an update on Dec. 19. “The representative I spoke with would only tell me that $17 had been refunded and that I would receive a letter explaining everything,” Van Osten said. The letter arrived on Dec. 21, saying there was a refund of $17 but there was no explanation or comment about the remaining $280.60 charge. 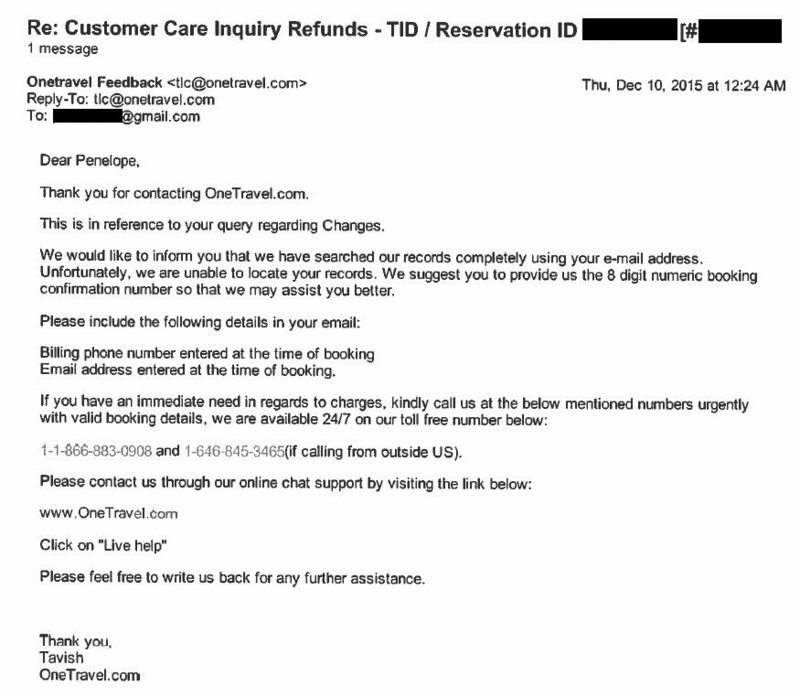 On Dec. 23, OneTravel emailed with a new contact phone number. Instead of a call, she received another email. This one told her to call the original unavailable number. “At this point, I gave up,” she said. We reached out to American Express, but our contact there would be out for a week. Then we looked at OneTravel. It’s a sister company to CheapOair, which Bamboozled has dealt with before, and both are owned and operated by Fareportal. We contacted the company, and supplied copies of all of Van Osten’s bills and emails. The company came back in short order, saying it was working with Van Osten to get the fraudulent charge resolved. We asked for more detail, but the detail wasn’t very clear. “Fareportal, upon receipt of the customer’s credit card statement, found that this was a fraudulent charge that did not originate from us, but we have refunded the customer and she will pursue this case with the credit card company directly,” spokeswoman Talisha Holmes said. Van Osten was indeed talking to the company. The rep also said the charge couldn’t be removed without the police report. But then she got a second call, this time from Reuben Bello, vice president of customer service at Cheapo Air/OneTravel. She confirmed that had no record of the purchase under Van Osten’s name, email address, street address or phone number, and the only way they were able to find the original charge was with her credit card number. “Reuben indicated that the original charge was made online, but neither Macy’s nor American Express can explain how someone who is not me was able to get my credit card information, including the three-digit code from the back of my card, in order to make the purchase,” Van Osten said. We’re still trying to get those answers for Van Osten, but Amex hasn’t gotten back to us yet. We’ll let you know what we learn. Van Osten did receive the check from OneTravel. 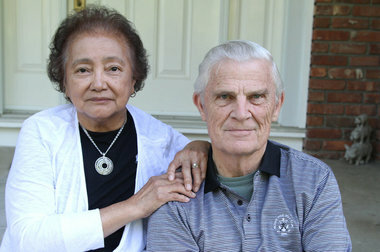 “I just paid off the balance of the bill so I can finally be done with this ridiculous matter,” she said. Have you been Bamboozled? Reach Karin Price Mueller atBamboozled@NJAdvanceMedia.com. Follow her on Twitter @KPMueller. FindBamboozled on Facebook. Mueller is also the founder of NJMoneyHelp.com. Stay informed and sign up for NJMoneyHelp.com’s weekly e-newsletter.